In little noticed remarks during the town hall meeting in Mumbai on Nov. 7, President Obama once again embraced globalism, while evidence is mounting that globalism means prolonged unemployment in the United States as the U.S. middle class slips into poverty. Any time D.R. God bless the Republic! Praise the Lord —-Get this stuffed shirt out of the White House & America before he has an opportunity to do any more damage to our Beautiful America. Send ALL illegals back to their own country. Put handcuffs on all the criminals who are jailed… and make marriage to be one man & one woman & cancel abortions so our children can live and NOT be aborted. There are couples in America who cannot conceive however, they can adopt !!!! Lastly, America has our own petroleum under our ground, so let’s retrieve it so our we don’t have to pay foreign countries through the nose to get our energy !! P.S. someone put up the American Flag so we can pay honor to it with the Star Spangled Banner. He is now fighting for unemployment insurance extention for us while Dems want to argue and gain points. Let the rich have their tax cuts as long as I can feed my family too. God Bless America. Lisa, You say let the top 2% have their tax cut. I have to disagree. There is no way anyone can justify borrowing $900 million in my grandchildren’s name that they will have to pay back, said monies to be given to the richest people in this country. I do not support borrowing from my grandchildren’s future no more than I support those that run up utility bills in their children’s names, which when those children become adults, they are put in the position of paying the bills or prosecuting their parents. You have not run out of benefits yet. I have been a 99er since May. I will not compromise through the lowering of our standard of living, accepting socialism to obtain unemployment benefits, or selling out my grandchildren, as I find all three of these options to be complicit with treason against the Republic. Every time one of these stories comes up I am so saddened by the negative remarks about people riding the system. Why people continue to think unemployment is “living the American dream” is beyond me. I guess there really are many many ignorant stupid people in this country. I am glad that so many have held onto their jobs and think all is fine and dandy in this country. Good luck to you in the future. When you lose your job and there are literally hundreds of applicants fighting for the few jobs that are available then you’ll know what it truly is like out there. I just want to know why it is okay with you that our government bailed out our failed banking system…you know the system that is STILL strangling our economy by not giving any loans out to get businesses moving and hiring again. These organizations are keeping this country in the mess it is in but no one seems to complain about that. No, you just post negative things about your friends and neighbors that have had a stroke of bad luck and need assistance (that they paid into while working no less!!). You treat them like they are stealing from you which is just another uneducated assumption. Try taking your aggressions out on your government and your president that got us to this point by throwing money at every lame business to try to save the country. It is really amazing that we even call ourselves The United States anymore. We are all but united. People turn their backs on each other at the drop of a hat and no one gives a crap about anyone but themselves. If you are truly stupid enough to think that anyone living on the paultry income unemployment provides is enjoying some free ride then you need to wake up. Anyone I know that is unemployed would give anything to be working again. If you look outside of your bubble maybe you’ll see just how bad things really are in our country….maybe. It probably wont happen for most though. People just love to be negative in this country. I guess it makes you feel better about yourself to put others down when they are already down and out. Good for you. I do not know if you addressed your comment to the wrong person but if you are addressing me, I have to ask what the hell are you talking about? With the release of the USGS report on oil reserves in the North Western US being larger than the entire middle east, this untapped reserve has been known for awhile, but kept quiet by our lap dog media. We should be paying .25 a gallon for gas, not $4.50. This is unacceptable. There is NO NEED to buy foreign oil, we’ve got more than enough here. Why is your government making you do this? The world must have balance. Whoever believes their rights supersede the rights of another must learn the lesson of law. We all have the right to prosper and that’s the law. 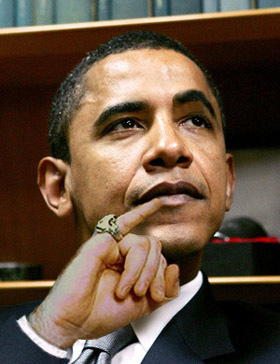 This usurper is a fraud by any means, I think Frank Marshall Davis is this mental midget’s real father. Ya see, when the globy puppet masters are done w/ a puppet, it’s carcass thrown to the masses for exposure and consumption and it looks like We, The People are finally whetted w/ some justice. In reality, this was all planned long before by the globy pr#@ks, just a convenient way to take out the trash! 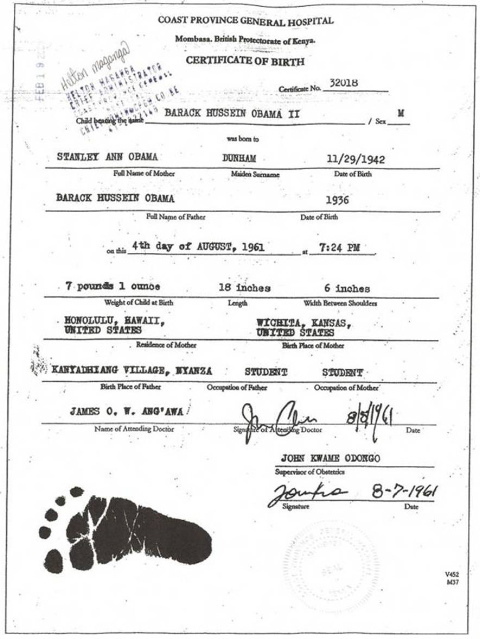 I believe that Sorento or whatever name & social security that IMPOSTOR USES was born in KENYA & his mother may have been a U.S citizen but his father has a DUAL CITIZENSHIP from the NOT SO GREAT BRITAIN & INDONESIA, which would make BARRY INELIGIBLE. FRAUD! That birth certificate hasn’t been verified, but neither has the purported HI one, now proven a fraud. We should check that footprint against Bari’s. Congress is charged with vetting the Candidates for President before the they can be eligible. Congress is the guilty Party that got us this foul, “Satanic Creature” who is destroying Our Republic.